Have you thought of buying a cordless brad nailer with same power level of a corded pneumatic brad? Few years back this could be a dream but no more. Now battery powered brad are gaining ground and it’s the right time to buy cordless brad nailer. Starting with DEWALT DC608K brad nailer, We are going to review best cordless brad nailers for you. DEWALT DC608K is powered by high capacity XRP series 18-volt NiCad (Nickel–cadmium) battery that is designed to have 40% more run-time than standard batteries. So next time when you use this cordless brad nailer in your furniture building adventures, you’re definitely going to enjoy the feel of portability and uninterrupted nailing for long time with speed and ease of a pneumatic nailer without the need of carrying a compressor and air hose like an air brad nailer. DC608K is the right tool for trim carpenters, cabinetmakers, and particularly for professionals routinely install baseboard, shoe, crown, and chair rail moldings, paneling, and window and door casings and jambs. Have you found what you are looking for? 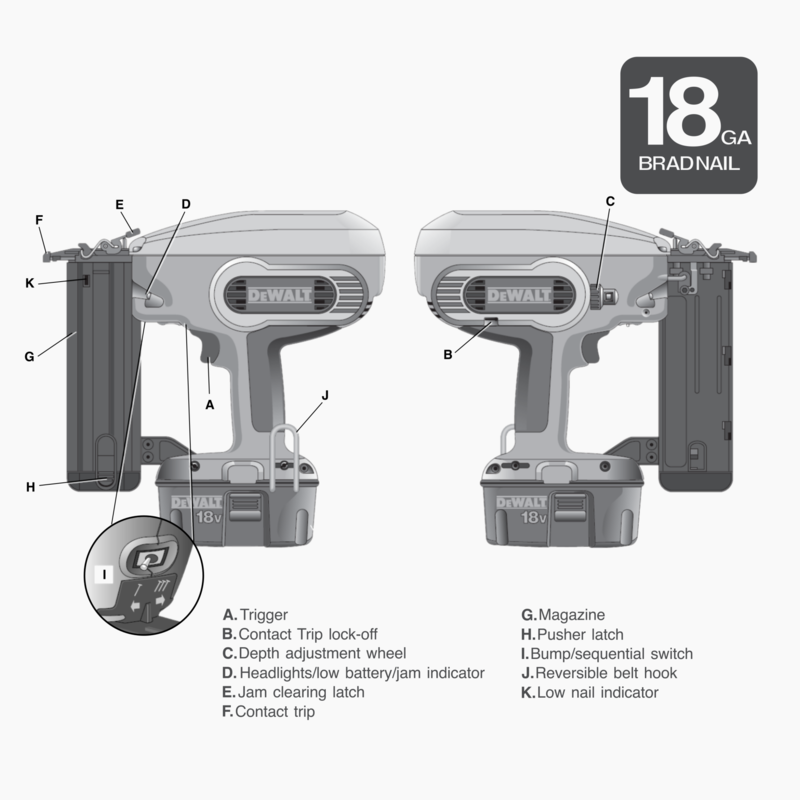 Ok, we know the answer, you need more information on this cordless brad nailer before you can give your verdict. Find more in-depth information about DC608K in the later part of the DEWALT DC608K 18-Volt 18-Gauge 2-Inch Brad Nailer Review. But if you’ve decided to buy a battery powered cordless brad nailer, DEWALT DC608K should be in your consideration. What we like most about DEWALT power tool is their attention to detail not only limited to power tool design itself, it also true for accessories and packaging included for different products. DC608K is shipped in a hard carrying case for tool protection and also act as storage for other accessories. In terms of accessories DEWALT DC608K 18-Volt 18-Gauge 2-Inch Brad Nailer Kit may be the deal you’re looking for. You don’t have to take my words at face value, see things DEWALT included in the packaging. 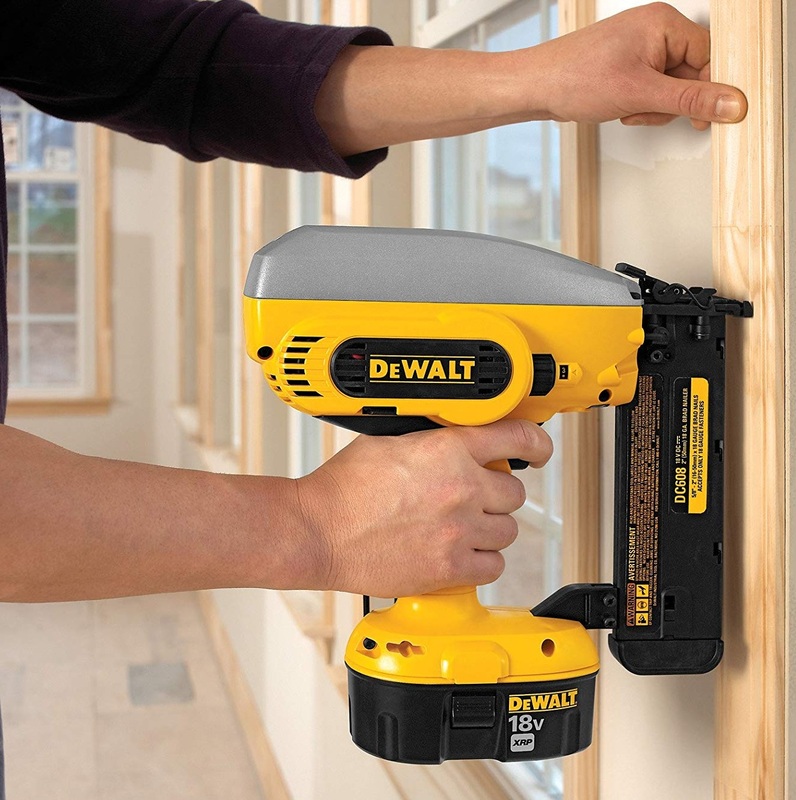 You may have noticed DEWALT DC608K designed to run on NiCad battery while most of its competitor rely on Lithium-ion battery design for a cordless brad nailer. This may seem DEWALT is not following the power tool industry’s overall trend in technology adoption. As a major power tool manufacturer, it remains loyal to professional contractors who already own other NiCd powered tool. Thus offering NiCd powered tool is relevant for the market they serve. We like the battery only design philosophy because it makes things easier for first time user. DC608K is also compatible with other DEWALT 18V battery packs. With another fully charged battery, you can do all kind of trimming job literally for unlimited time. 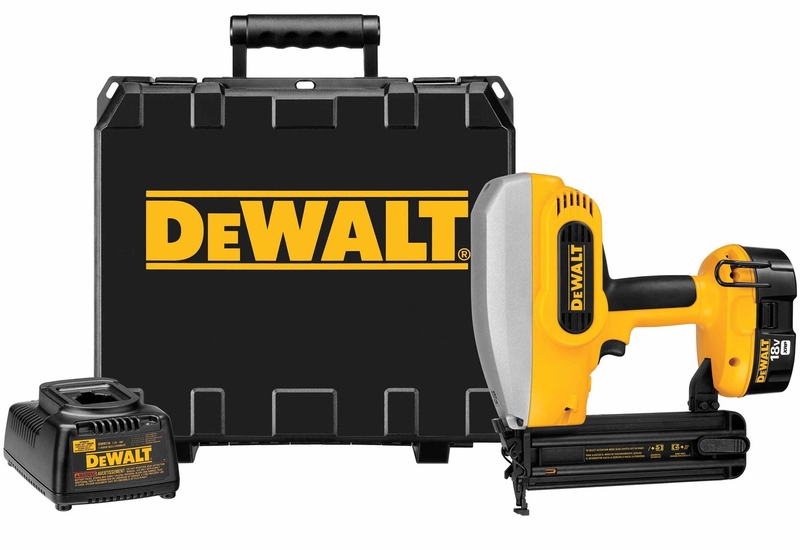 You may also notice that the overall body shape of the DEWALT DC608K is quite different than a pneumatic brad nailer which is true for all available cordless brad nailer. Apparently, the body of DC608K has a larger diameter in contrast to 18 gauge pneumatic brad nailer however height and depth of the tool mostly similar. Despite its non-symmetrical appearance and larger size; you will find it nicely balanced when you hold the gun with its battery unit in place. DeWALT DC608K 18 Gauge Cordless Brad Nailer has impressive performance features that make it a unique kind of cordless brad nailer, and if you are looking for a perfect replacement for your pneumatic brad nailer, you don’t have to look far, it is right front of you. Our first concern with a battery powered brad was can it generate enough force to push fastener into work surface. The DC608K is equipped with a powerful engine (motor) that work as fast as the end user with consistent nail penetration into both soft and hard joints. We found it can drive at five brads per second through softwood, hardwood, plywood, and other sheet goods with 18 GA brad nails from ⅝ to 2 inches in length without any problem. To make your nailing experience more meaningful a 12-position dial is there to select desirable depth for sinking brad nail based on the material on hand, so you don’t have to reacquire depth setting every time when you move from one application to another. As for controls, DEWALT added not one but two firing modes in DC608K. With dual firing mode, DC608K 18 Gauge 2″ Cordless Brad Nailer has it all to control different firing operations. You can go for either contact or sequential actuation firing mode. In actual operation that translate into your ability to do precision nail placement when you choose sequential firing mode ( see the picture i.e single nail for sequential trigger and triple nail for bump fire) and do the faster nail placement with bump operation mode ( shoots a nail every time you press the nose against the work surface with the trigger is depressed). There is a mode selector switch for easily changing firing mode by simply moving on-off style toggle switch that is cleverly placed in front of the trigger. You will also find a Contact Trip Lock-Off to disable the trigger when not in use on the same side of the gun where depth adjustment setting is located. Another interesting feature we liked is the integrated LED lights that illuminate your work surface, this will come handy when working in dark corners and tight spaces. We forgot to mention few other features that are equally mind-blowing and responsible for brad nailing performance. Unlike other straight style magazines, the DC608K fully enclosed box style magazine is very easy to open and load with nails that also bar dust and debris find a way into the magazine and prevent tool malfunctioning. Nosepiece is designed with a latch for quickly accessing jammed nail and remove it without the use of screwdrivers or tool wrenches. 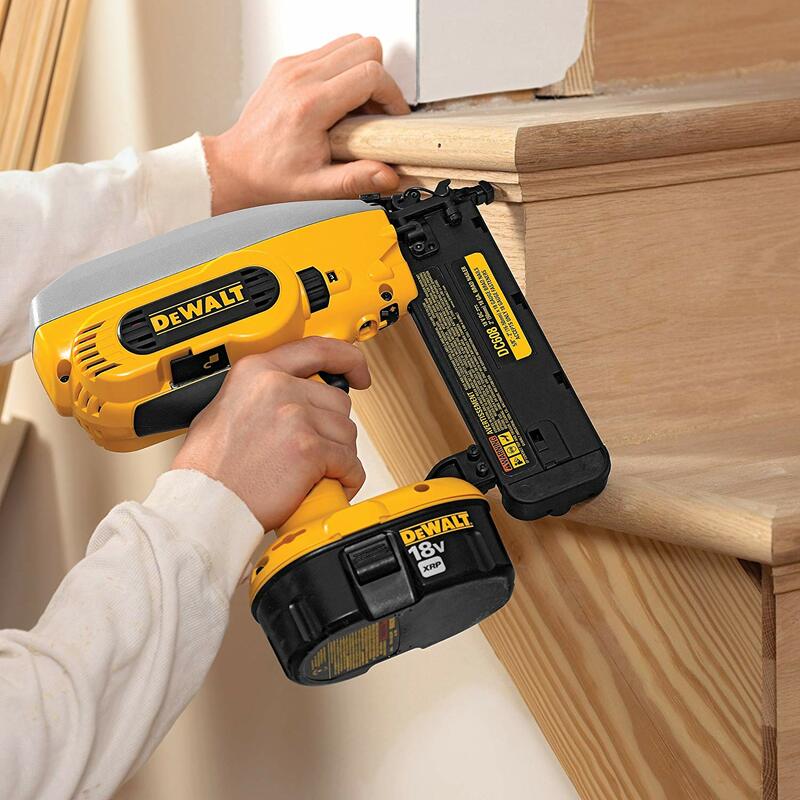 The DEWALT DC608K 18 Gauge Cordless Brad Nailer is suitable for new construction and remodeling applications, all kind of door and window trim, paneling, baseboard, casing, other trim work and different home furniture building such as cabinetry, storage system and many more. Narrow, tapered nose of DC608K fits into tight spaces, such as under toe kicks and inside of cabinets. You can use it just like other plug n play devices, connect the battery with this nailer and start using because there are no cords or hoses to hold you back. This tool is available in major online retail stores and already sold in large quantity and plenty of reviews done by verified purchases. Good news is DEWALT DC608K received average 4.5 out 5 rating after combining all reviews from the three major online retailers. Not only that at least 83% of the buyers posted they were pleased with their purchase and gave the kit a 5-star rating. Negative review for the tool is very minimal, just 6% overall buyers rated 3 or less than 3. Buy It, Don’t Buy It! This is the most difficult question for the product reviewer. DEWALT DC608K is a versatile cordless brad nailer among the model available right now in the market. It has enough features and capabilities to be adequate if not perfect replacement for a pneumatic brad nailer. Nonetheless, you can consider the good and bad or pros and cons listed here before making your final decision. Dual firing mode – Sequential for precision placement and Bump operating mode for speed. Fully enclosed, box style magazine keeps dust and debris out of the magazine. Top cap is impact resistant and easy to remove for troubleshooting. Easy removal of jammed nail without the use of screwdrivers or tool wrenches. Low battery, nail and jam indicator. Integrated LED lights for illuminating work area. 1 hour charger and 18V XRP™ battery. 3 years warranty, 1 year free service and 90 days money back guarantee. NiCad battery is heavier compared to Lithium-ion. The DEWALT DC608K is an ideal 18 Gauge Cordless Brad Nailer Kit, a combination of precision, speed, and mobility. It can appeal both professionals and enthusiast hobbyists alike for its ability to do all kind of trim and repair jobs. It is especially true for those who already own other 18V tool and expand their tool collection. We however found that overall weight of nail gun is bit on the heavier side compared to 18 GA pneumatic brad and also you have to pay a premium price. Being said that its portability and near perfect features are worth for your money if you consider the hassle of bulki compressor and air hose you have to drag into job site with your pneumatic brad nailer.